With the looming prospect of mass immunization against influenza, it’s important to understand how vaccines work. To do this we must have a good understanding of adaptive immune defenses. Today we’ll begin a discussion of the humoral arm of the adaptive immune response – antibodies. Antibodies are large proteins produced by vertebrates that play important roles in identifying and eliminating foreign objects. The basic structural unit is composed of two heavy chains and two light chains, as shown in this diagram. Antibodies bind other molecules known as antigens. Binding occurs in a small region near the ends of the heavy and light chain called the hypervariable region (labeled only on one arm in the figure). As the name implies, this region is extremely variable, which is why vertebrates can produce millions of antibodies that can bind many different antigens. The part of the antigen that is recognized by the antibody is known as an epitope. There are five classes of immunoglobulin—IgA, IgD, IgE, IgG, and IgM—defined by the amino acid sequence of the heavy chain. They have different roles in immune responses; IgG, IgA, and IgM are commonly produced after viral infection. During the first encounter with a virus, a primary antibody response occurs. IgM antibody appears first, followed by IgA on mucosal surfaces or IgG in the serum. The IgG antibody is the major antibody of the response and is very stable, with a half-life of 7 to 21 days. When an infection occurs with the same or a similar virus, a rapid antibody response occurs that is called the secondary antibody response. The specificity and memory of the antibody response are illustrated in the following graph. A typical adaptive antibody response is shown as the relative concentration of serum antibodies weeks after injection of an animal with antigen A or a mixture of antigens A and B. Maximal primary response to antigen A occurs in 3 to 4 weeks. When the animal is injected with a mixture of both antigens A and B at 7 weeks, the secondary response to antigen A is more rapid and stronger than the primary response, demonstrating immunological memory. 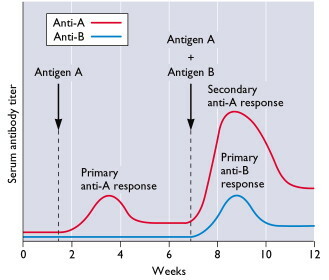 As expected, the primary response to antigen B requires 3 – 4 weeks. Antibody levels (also called antibody titers) decline with time after each immunization, a property known as self-limitation or resolution. Antibodies are critical for preventing many viral infections, and may also contribute to the resolution of infection. We’ll next explore how antibodies accomplish these diverse activities. and then go down ~5weeks ? but not against seasonal H1N1 in the years before 1957 ? Why do some adults have antibodies against mexflu and children not ? similar (not identical) H1N1 virus between 1918-1957. I'm having a little trouble interpreting the first chart of an antibody. The text states that an antibody is composed of two heavy chains and two light chains. However, on the diagram I can only find one of each. Is that because the graph is actually a cross-section of the 3-dimensional antibody? Pretty basic question I know, but I wanted to be sure. Also, I'm curious what the “biological mediation” and “complement binding regions” do. I imagine that discussion follows. chains. There are two shorter blue lines; those are the light chains. Thanks, I get it now. I was reading the schematic incorrectly. I do very much appreciate having the lessons in short chunks. I just found those two terms intruiging, as I tried to imagine what they might do. As ever, many thanks for all the effort you are putting in to educate us all. 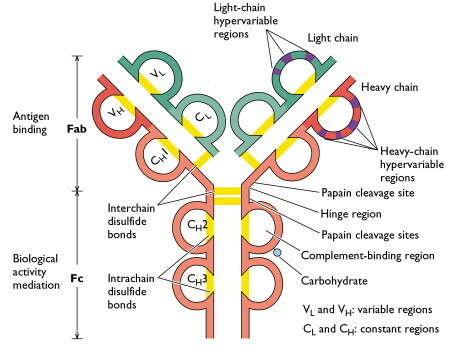 I think there is possibly a typo on your first diagram: in the top left branch of the ‘Y’ there are two labels inside the blue (light-chain) loops, these labels read VL and CH, but I think the second of these labels should perhaps read CL rather than CH (since it is part of the light chain)? A small point, but looking at your first antibody picture: should the “CH” in lower part of the left-hand light chain actually be labelled “CL”? MBM and swhiting are both correct – the diagram is mislabeled. The constant region of the light chain should be labeled CL not CH. Thanks for picking that up. How do you know you had H1N1 influenza? Was it diagnosed in a laboratory? If you did not have laboratory confirmed influenza, you should receive the H1N1 vaccine. I am just wondering what can happen if a person is already immune to H1N1 influenza an receives a H1N1 flu shot? Is it possible to have an adverse reaction to the vaccine for that reason? The minimum time for the H1N1 booster is 21 days, the recommended time by the CDC is 28 days but is there a maximum time when the booster would no longer trigger adaptive antibody response? I ask because my 1 year olds pediatrician is not scheduling boosters at this time due to vaccine shortages. simply disappears completely and IgG never develops? Is the diagram above based on an actual set of experiments? If so, could you direct me to the primary source? I want to know approximate number of antibodies and Memory cells(B and T) that are created after the infection.